The new year is always a great time to refresh your kitchen design. There are many trends that are taking over 2019, from gorgeous accents to custom kitchen cabinets. Are you planning to change the vibe in your kitchen? 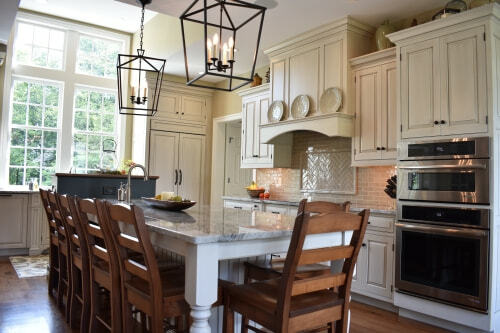 The following guide features 10 top custom kitchen remodeling trends in 2019. Rose gold accents were popular in 2017 and 2018, and this trend is maintaining its popularity in 2019. You can pair rose gold accents with metals such as brass, copper, black and pewter. Rose gold accents also look good with bright or pastel colors, such as blue, pink and purple, as well as a light-colored wooden dining table. If you are looking to upgrade your kitchen cabinets, you may want concealed storage as your next upgrade. It offers a clean look that is perfect for white, black or wooden cabinets. The cabinets may not include any knobs or handles, but you can still open and close them with ease. You can use concealed storage on cabinets and drawers of most sizes. It is no secret that technology is taking the world by storm, and now you can add technology to your kitchen to make daily tasks a breeze. You may want to add something as simple as a light switch that turns on and off with the wave of your hand. Maybe you would rather add a WiFi-enabled coffee or espresso maker that prepares your hot beverage before you even step into the kitchen. Whether you want to show off your modern tile or elegant marble, a taller backsplash is like having a work of art in your kitchen. You are going to need to order custom kitchen cabinets if you want to use a taller backsplash, as the upper cabinets are going to be smaller. It is worth it to show off your beautiful backsplash, and you can still store items inside your cabinets. There are many homeowners who are replacing their upper cabinets with open shelves. The open shelves allow you to display your dinnerware, fine China and decorative pieces. When planning your custom kitchen remodeling project, you can choose open shelves made of wood, metal or glass to fit your interior. You may even decide to have your open shelves painted to match your color scheme. If you enjoy the look of your concealed storage, you may want to consider a concealed range hood as well. You can hide the range hood behind wood to blend in with your custom kitchen cabinets and other wooden pieces. Concealing your range hood, like the one featured in this traditional home remodel, brings more attention to elements such as your accents, backsplash, and appliances. Custom kitchen cabinets in matte black are popular in many kitchens, especially since they work with different styles. For example, matte black cabinets can be paired with stainless steel appliances to create a modern look. However, they can also be paired with wooden counters to create a warm vibe. Regardless of which style you choose, or if you choose a transitional kitchen remodel, you can tie everything together with a black tile backsplash. Stainless steel appliances are attractive and easy to maintain, but black appliances do not demand as much attention in a smaller kitchen. Microwaves, stoves, and refrigerators can all be found in black to fit your style. One idea is to pair your black appliances with your black custom kitchen cabinets for a seamless look. If you feel black appliances and cabinets are too much, give your eyes a break by pairing your black appliances with a light gray or white interior. Are you looking to shy away from the black palette and brighten things up? You may want to follow the trend of two-toned kitchens in 2019. Start with a white interior as your base, and then install custom kitchen cabinets and drawers made of wood. 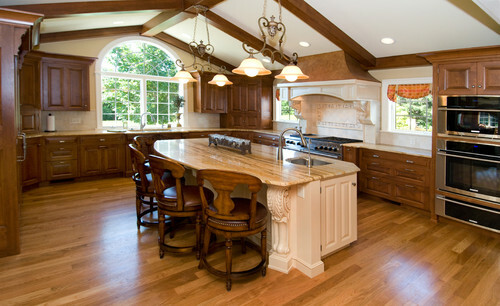 Here’s a beautiful example of a luxurious traditional custom kitchen. The white interior creates an airy feeling in your space, but the wooden elements add a natural vibe. You can also make the space feel bigger by replacing your upper cabinets with white open shelves. Speaking of two-toned kitchens, this is a great time to think about your cabinets. One idea is to use white and gray cabinets in your kitchen. White and gray are contrasting colors, but they do not clash to the point of creating an eyesore. You can pair the two-toned cabinets with subway tiles, large pendant lights and wooden elements, depending on the style you have in mind. It is always fun to check out the top kitchen trends of 2019, from experimenting with two-toned custom kitchen cabinets, to concealing your range hood, to embracing technology. At RM Kitchens, we work together with you to find out what style is perfect for your kitchen. Get the custom kitchen cabinets of your dreams. We design and build your new cabinets right here in the USA and can be delivered nationwide. Our kitchen remodeling services are perfect for those living in Central Pennsylvania (Harrisburg, Hershey, Carlisle, Lebanon, Mechanicsburg, Gettysburg, Lancaster, York, and Reading, PA). Call us today at 717-967-4038 or schedule a free consultation to get started! Ready to Get Your Dream Custom Cabinets? 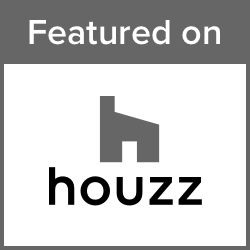 Contact us today to schedule an appointment with one of our expert cabinet designers! We can talk over the phone or in person at our Central PA showroom. Nationwide delivery.